Acknowledged author Roger LeRoy Miller wrote Business Law: Text and Cases comprising 1328 pages back in 2017. Textbook and etextbook are published under ISBN 1305967259 and 9781305967250. 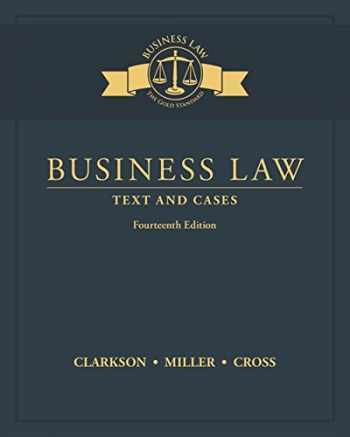 Since then Business Law: Text and Cases textbook received total rating of 4.5 stars and was available to sell back to BooksRun online for the top buyback price of $42.53 or rent at the marketplace. Comprehensive, authoritative, and reader-friendly, market-leader BUSINESS LAW: TEXT AND CASES delivers an ideal blend of classic "black letter law" and cutting-edge coverage of contemporary issues and cases. Today, BUSINESS LAW, 14E continues to set the standard for excellence. The text offers a strong student orientation that makes the law accessible, interesting, and relevant. The cases, content, and features are thoroughly updated to represent the latest developments in business law. Cases range from precedent-setting landmarks to important recent decisions. Ethical, global, e-commerce, digital, and corporate themes are integrated throughout this edition with new features, such as new Digital Updates that demonstrate how digital progress is affecting the law. Specific text features that students will find particularly helpful include: NUMBERED EXAMPLES and CASE IN POINTS, SAMPLE ANSWERS, NEW STUDENT-FRIENDLY CONCEPT SUMMARY DESIGN, and EXHIBITS.